If you had told me this time last year that I would be gearing up for the top of the world, it would have immediately been met with scorn. In fact, the notion of entertaining a climb on Everest had all but vanished from my aspirations. It was too expensive, too crowded, too too overdone. There were more remote places which summoned me round the world. Two years ago, I stood on a hill outside of Tingri, Tibet. We were acclimating for a start up Cho Oyu. The dusty backwater of Tibet ceded a cloud formation that relented and exposed what the locals called Chomolungma, or, Goddess Mother of the Earth. As I peered across the border of China into Nepal the familiar ice plumb was jetting into the sky from the summit of earth’s highest peak. It was Everest in all her glory and my first ever sight of this mountain. Days later when our expedition had made several camps up to what would become our base camp for Cho Oyu, the thin air of 18,000 feet held secrets of her own. Down valley from our tents, across the Cho La pass was Nepal. 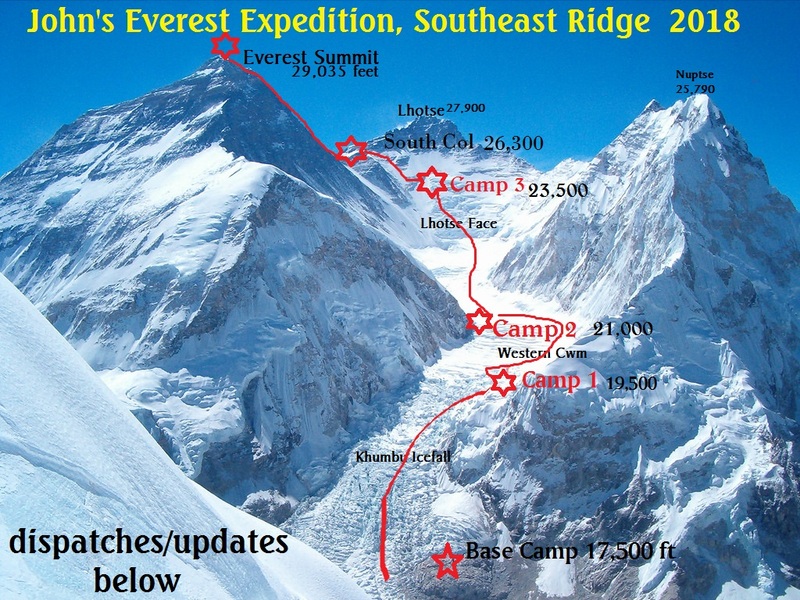 And not far was base camp for the southeast ridge side and standard Everest route. Something told me I would end up there at some point. After corresponding with Ashraf Aman, owner of ATP with whom we contracted for ground services on Broad Peak, I was forced to abandon that notion. Pakistan would have to wait a while longer. Still I trained with a fervor throughout the summer, primarily mountain biking, sometimes twice per day with big hill climbs and long, leg burning sessions. I interspersed those with interval runs, swimming and a weight lifting routine. Rock climbing days were the “easy days”. I was getting in the best shape of my life, cardiovascularly. About this time I began to hear from my team mates on Cho Oyu. Not surprisingly, they were all readying for Everest this spring. Two of them invited me to join their expeditions but it didn’t move me primarily because they were planning to attempt the North, Tibetan side. You may remember this is the side from which my teammate Andrea summited last spring. If ever someone invited me to climb the South Col route, that would present an appealing proposition. But it didn’t happen. Fast forward to January when an old friend contacted me about one of her relatives in hopes I could advise the family with advice on handling a loved ones substance abuse problem. (This happens way more often than you would ever believe, ever). As we navigated the choppy waters often accompanying the disease of addiction and developed a plan to secure treatment for the person, I realized that my friend, (not the one in trouble), had accepted a position with a fortune 500 company. Long story even longer, I approached them with the idea of sponsorship. And to my surprise, everyone at the company was excited about my proposal. 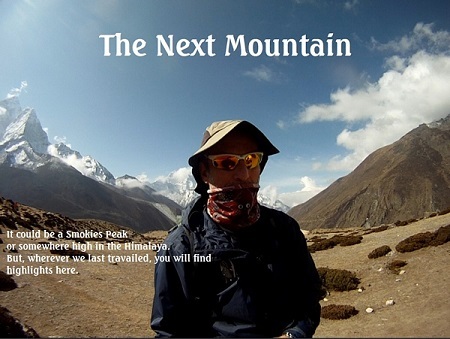 I would hike to Everest basecamp using their communications device, showcasing its potential at the top of the world. I couldn’t believe this could possibly come together. As the negotiations continued, I began to envision myself climbing Everest on someone else’s dime. At that point, the vision of Sagarmatha was consuming my brain. My friend got approval for full funding all the way up to the CEO. His last words were, “Let’s just make sure engineering signs off on this”. I checked my email daily until that dreaded correspondence arrived. It began like this. So, in summary, not only will I be climbing Everest, Laurel will be joining me in the famous trek to base camp. It is described as one of the most breathtaking journeys in the world. We land at Lukla, the world’s most dangerous airport, featured here https://theplanetd.com/everest-flight-one-adventurous-ride-to-lukla/ From there we begin our 9 day walk to Everest base camp. I am super excited and incredibly busy. Being self employed means taking care of all your obligations therein, not to mention the mountain of accompanying logistics. But it is all coming together quite nicely. In March I will fly to Alaska to do some ice climbing and training with my old Denali buddies. There I can dial in last minute gear purchases in the frozen north and enjoy the fellowship of these fine men. I will, in usual fashion, be posting updates here on this site. If you are an environmentally responsible business entity and are interested in attaching your name to this project, I would love to hear from you and discuss how to market your product at the limits of upper earth. Seeing your name on the highest peak is always a great marketing tool. You can contact me here. http://johnquille0.wixsite.com/broadpeak/contact I would love to discuss the possibilities with you. It will be a grand adventure, and I am incredibly excited. Everest is calling, and I must go. That’s awesome, John. I can’t wait to follow along. Jeff, There should be wifi along the trek and in basecamp for a price, so I hope to keep things freshly updated. You know what they say, bring a lot of gear and even more money and patience. John, I hope you have both an incredible and a safe trip. Lama Geshe of the Pangboche monastery passed away a week or so ago, but I’m sure you can still find an inspiring puja ceremony along the way. Thanks John, good to hear from you. Sad about Llama Geshe, was looking forward to a blessing. Didn’t you head up that way a while back?